Steve is annoyed. Oh very dear. He is annoyed at Stewart Reuben. So what appears to be riling Steve - and appears is a useful word in this respect - is Stewart's reply in the letters column of the Times to a chess column in that same publication. And aside from Steve's apparent outrage, there was a reply* in the letters page on 9 October. ...hold on. This is cobblers and everybody knows it. 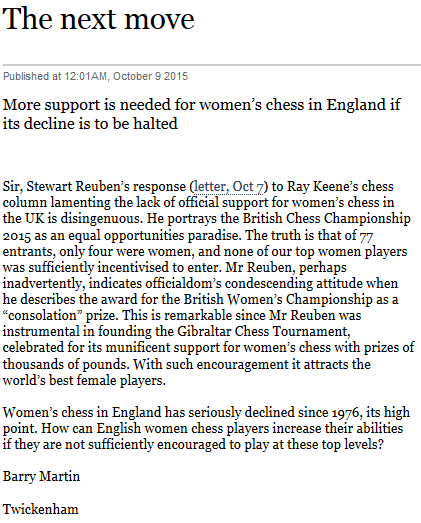 This is a discussion between Stewart Reuben, who knows an awful lot about English chess but next to nothing about inclusivity, and Barry Martin, who doesn't know enough on the subject to distinguish between a men's competition and an open. I'll write that again: and Barry Martin. Why are the opinions of Barry Martin being touted as if they meant anything? 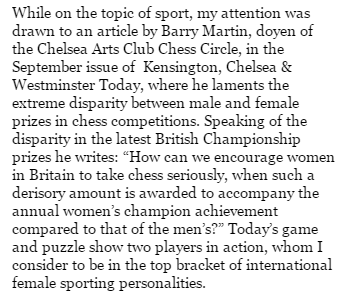 Because, as both Steve and Stewart know very well, if Ray is quoting Barry Martin it's not because the, um, "doyen of the Chelsea Arts Club Chess Circle" has an important opinion on the subject of gender in chess. Barry Martin could know nothing about this subject or any other and it wouldn't make any difference. He's quoted because Barry Martin is Ray's mate and has been for donkey's years, and as with the Spectator, plugging family, friends and associates is in large part what the Times column is there for. It's brazenly used for publicising and promoting Ray's inner and outer circle. This includes Steve, of course, since a fair proportion of Ray's columns this year have involved regurgitating Steve's notes from one book or another. Steve knows this, and so does Stewart: they also both know (though Stewart tries to pretend otherwise) that the Times chess column is a public disgrace characterised by plagiarism and the industrial-scale reuse both of other people's work and the supposed author's old notes. So what we have is a personal spat (since Steve has a well-publicised loathing of Stewart) hung on the peg of an ill-informed discussion, deriving from a disreputable and discredited chess columnist, who has shoehorned an old mate into a column. 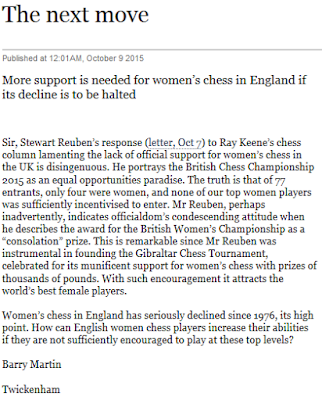 So I take the view that while there's plenty to be written about women's chess and the ECF, this particular discussion is manifestly not a contribution to that goal and to treat it as such - Phil Ehr and John Foley - is to invite ridicule. EDIT ONE 12 October: as PH observes in comments, the end of this piece as originally written is a nonsense on my part, so I've cut it. drew a negative reply from an ECF member that The Times also published. 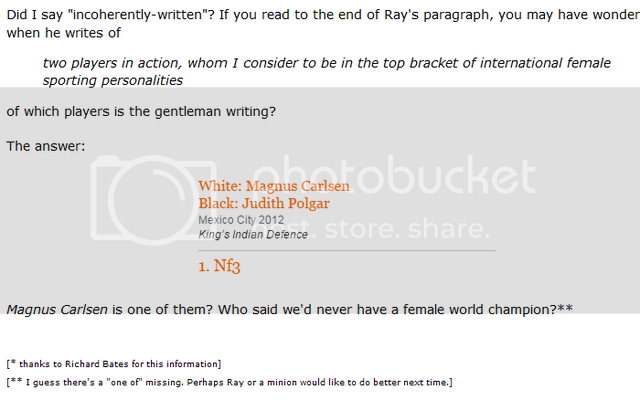 Looking at the ECF's membership list - go to http://www.englishchess.org.uk/ and on the front page click where it says Membership and access the drop-down menu - and there's no Barry Martin there. I wouldn't have expected him to be there. Why would Phil Ehr say, or assume, that he was? Well, if we want to return to the high point for English women's chess of 1976, presumably what we're going to need to do is get one of our top players to marry one of the top 20 women in the world and bring her over here to live, since that's how we achieved our 1976 highpoint. I'd have thought David Howell was the obvious candidate to step forward and take one for the team. Maybe some kind of ECF grant? He's annoyed with you too....Keene wrote "today's game and puzzle......" Game is Polgar, Puzzle is Yifan. Two female players. Perhaps the minion who should have checked is at this end? A halfwit writes: indeed so. Ugly truth? The special prize for females is of course specifically there to help promote the participation of females in chess. I presume, given that it is described as consolation prize, that you cannot collect (at the same time) the prize money for both British Open Champion and British Female Champion. So what is Barry Martin's point - that there should be (1) a separate competition for Men and for Women , or, (2) that the 'consolation' prizes should be larger? In the (now defunct) Women's World amateur Go Championship, one of the category prizes was a hairdryer.